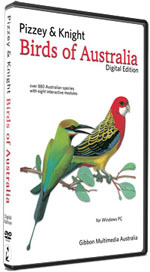 Take a tour of the Pizzey and Knight Birds of Australia Digital Edition. The BIRDS database includes • over 250 field-guide pages • over 900 individual bird pages • all the ‘new’ bird species and names • over 2500 illustrations, 4000 photos, and 700 bird sounds • completely revised and colour-coded distribution maps • rare bird maps and records • seasonal status bar • endemic species. Additional functions include • Edit bird pages and birding site pages, and add your own photos and multimedia • Enjoy a screensaver with over 2000 photos. System Requirements: Windows 10/8/7/Vista/XP. Minimum hard drive space 1GB. The program is distributed by download or DVD disc. This program is designed for Windows PC. There is no Apple Mac version, but you can install Windows on an Apple Mac using Bootcamp.